In Arizona, America's second driest state, water is the most critical natural resource. Isolated by arid, expansive landscapes, springs are ecological islands of habitat that support a wide array of species. Find three of our current projects highlighted below. The Verde River Basin (VRB) is a large watershed in central-northern Arizona. The Verde River is one of the last perennial rivers in Arizona, but has undergone substantial changes as the population of Yavapai and Coconino Counties have increased, placing substantial pressure on ground and surface water resources (Blasch et al. 2006; Haney et al. 2008). As an aridland river, it is subject to highly variable surface flow inputs, but its baseflow is sourced from a number of springs. Springs of the Verde River watershed support a wide array of wetland and upland plant and animal species. Our goal in the following report is to provide information to help the VRB community conserve and, where possible, preserve and restore flow, water quality, fluvial habitats, and the diverse plant, fish, and wildlife populations in this remarkable river basin. Integration of the information presented in this report into the community and into policy may help Verde River basin residents more thoroughly understand the roles, distribution, and importance of springs in maintaining Verde River baseflow, water quality, and springs-dependent species populations. We intend to provide a basic framework for future water quality and quantity monitoring, as well as habitat mapping, assessment, and enhancement, by resource managers and concerned citizens. The Nature Conservancy, with the Arizona Water Institute and Verde River Basin Partnership, published an extensive report, Ecological Implications of Verde River Flows. Royal Arches, a hanging gardens springs system in Grand Canyon. Photo by Larry Stevens. The Grand Canyon ecoregion contains over 1,500 springs (that we know of). The towering cliffs expose the edges of aquifers, resulting in one of the highest concentrations of springs in the United States. SSI will conduct a pre-treatment inventory of Roaring Springs and other control sites in Bright Angel Creek basin to provide control data for future assessment of construction impacts on the Roaring Springs ecosystem. Learn more about springs research in the Grand Canyon. Nevada, America’s driest state, contains a high concentration of springs. As in other arid regions, the number of springs is unknown, and hundreds likely remain unmapped. The Nevada Department of Wildlife presents a springs map in their 2012 Draft Wildlife Action Plan. SSI is working with the Nevada Natural Heritage Program and the US EPA to compile and refine information about under-studied springs. In addition to resolving uncertainties and questions on previously compiled data, the SSI team will conduct over 200 inventories and assessments of springs in under-studied regions. New Mexico, another arid southwestern state neighboring Arizona, also has numerous and diverse springs ecosystems. As with other arid states, many springs in New Mexico remain un-mapped and understudied. In cooperation with the New Mexico Environment Department Surface Water Quality Bureau Wetlands Program, SSI is working to develop a Rapid Assessment Protocol for springs in southern New Mexico. This rapid assessment protocol for springs will allow New Mexico to develop a framerwork to assess the condition ofs prings and prioritize restoration opportunities. 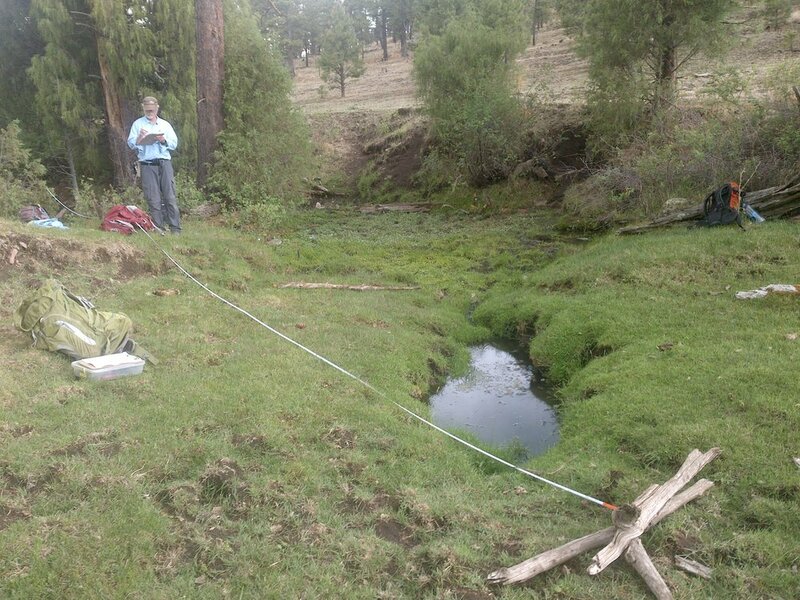 In addition, SSI is conducting full surveys of over 40 springs in southern New Mexico. Native springs play a vital role in sustaining the ecosystem within Naval Air Weapons Station China Lake. Maintaining viable native springs through effective stewardship is an important component to NAWS China Lake's Integrated Natural Resources Management Plan. The first step to maintaining and improving effective spring stewardship requires creditable and consistent assessment and monitoring based on thorough scientific survey. SSI is conducting on-site springs surveys and compiling reports on each of the surveyed springs. Springsnails are often highly endemic to individual springs ecosystems, a result of the role of springs as a paleorefugia for life developed when the Southwest was considerably wetter. Unfortunately, this endemism makes individual springsnail species vulnerable to extinction due to the vulnerability of springs to human and natural disturbance and change. The purpose of this project is to develop a comprehensive conservation strategy for springsnails in Utah and Nevada to safeguard the existing springsnail species richness and diversity. This strategy will help the Springsnail Conservation Team (SCT), and a group of agencies working under the 2017 springsnail Conservation Agreement, to develop a Conservation Agreements and Strategies (CAS) document that will allow for conservation actions and threat abatement. The long-term goal is to protect the 93 species of springsnails and prevent any new listings under the Endangered Species Act. You can view the first of five webinar’s that SSI will host as the Conversation Strategy is underway. SSI will develop local capacity for mapping and characterizing springs resources through workshops and trainings in Big Bend National Park, Parque Nacional Canon de Santa Elena, or nearby communitites. SSI's Springs Inventory Protocol (SIP) and Springs Ecosystem Assessment Protocol (SEAP) will be translated into Spanish. Officials from Mexican protected areas will meet with SSI to determine if any protocols need to be adjusted to meet the needs of those protected areas. The Springs Stewardship institute will improve and expand the decision-support functions of a database describing springs across a broad geographic area, including parts of Utah, Colorado, Arizona, New Mexico, and Texas. The project will also include the development of user tools, such as the ability to export landscape-wide geodatabases, as well as smartphone apps to support citizen-science data collection.